My colleague Nirvi Shah (who co-authors the Rules for Engagement blog and covers school climate issues) and I just wrapped up a multimedia presentation on school safety legislation since the shootings in Newtown, Conn. last December. 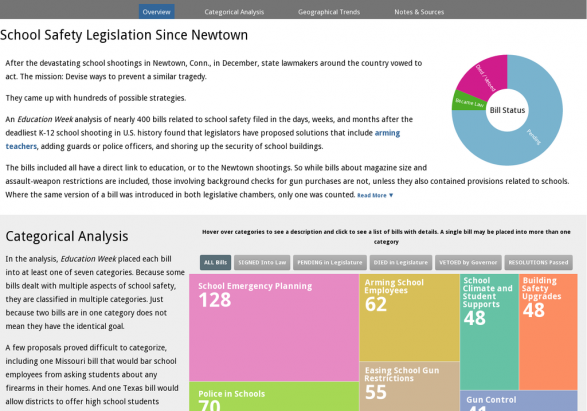 The interactive feature includes an analysis of school-related security legislation in every state. While Congress may have stalled in its attempts to improve safety for students since Newtown, states have been very active. The bills we looked at touched on a variety of themes, from school emergency planning and building safety upgrades to police presence in schools and arming teachers. You can check out the latest status of individual bills, look at the bills introduced in each state, and also read a geographical breakdown we did focusing on the popularity of various kinds of legislation. We also wrote a brief summary for each bill. The baseline information on the bills comes courtesy of the National Conference of State Legislatures, although we came across other pieces of legislation during our research and analysis. As we note in the presentation, if you think we have missed any relevant bills, please let us know. Nirvi can be reached at [email protected] (or on Twitter at @NirviShah), and I can be reached at [email protected] (@StateEdWatch).